Monsters are running amok, causing the world to reassess its beliefs, and making everyone deal with the untold madness that such revelations have caused. It can only mean one thing: that Monster Madness is about to begin. This playful slot machine comes from Tom Horn, presented in a 3x3 matrix, reminding us of more classic titles from a now bygone age. In spite of this nod to older times, the interface has interactive 3D graphics, with a cute monster stood next to the grid watching your every move. These monsters may have caused a frenzy of late, but they’re so adorable as they do so, with their big eyes staring out at you, that they’re hard to dislike. This is a heavily themed game and makes no apologies for it, and is by far the more attractive of Tom Horn’s activities. View more of Easy Slots! We’d be surprised if you haven’t heard of Tom Horn at least once since becoming an iGaming fan, but stranger things have happened. The reason the brand can be less easily recognised than others is because bigger companies tend to take centrestage, like Microgaming and Yggdrasil. Although these brands are excellent, Tom Horn clearly has hidden depths. 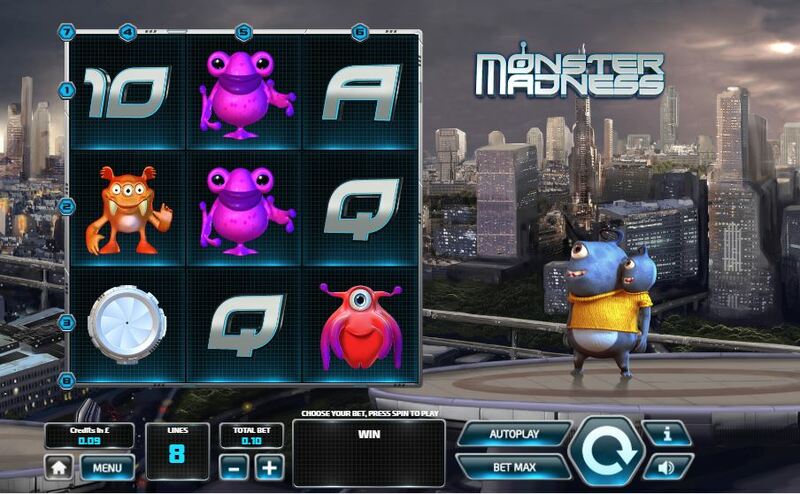 Monster Madness isn’t just ‘another slot’, it actually tells you a little story before launching into its 8 winlines, and so you feel more immersed in its aesthetics. When the game loads, we find ourselves on top of a building, the skyline in the background, and our monsterific friend helping us play along. The symbols of this game are separated into high value and low value, with the lesser valued ones designed to look like card suits. However, while it’s a shame that not every inch of this game is themed, it’s the scatter and scatter wilds that you’ll be more concerned about, and for good reason. * Scatter Free Spins: Although you can get a two of a kind combo of the scatters, only when you score three or more will the spins activate, with a nine of a kind win getting you 11 spins and x100 of your wager! 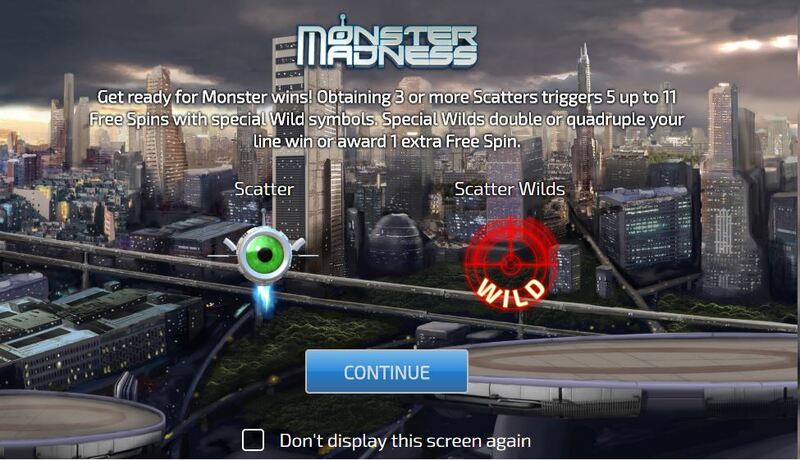 * Scatter Wilds: When playing the bonus games, one of two wilds can appear, either gifting you an extra spin or awarding your a multiplier worth x2.